"We'll be looking for the occasional celestial flash," said Joseph Lazio, a radio astronomer at JPL. "These flashes can be anything from explosions on surfaces of nearby stars, deaths of distant stars, exploding black holes, or even perhaps transmissions by other civilizations." JPL scientists are working with multi-institutional teams to explore this new area of astronomy. An innovative new radio telescope array under construction in central New Mexico will eventually harness the power of more than 13,000 antennas and provide a fresh eye to the sky. The antennas, which resemble droopy ceiling fans, form the Long Wavelength Array, designed to survey the sky from horizon to horizon over a wide range of frequencies. The University of New Mexico leads the project, and NASA's Jet Propulsion Laboratory, Pasadena, Calif., provides the advanced digital electronic systems, which represent a major component of the observatory. 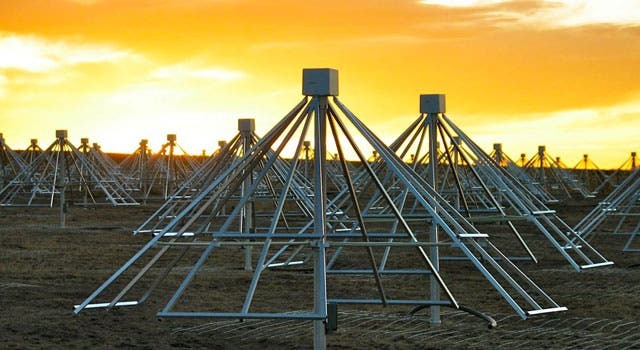 The first station in the Long Wavelength Array, with 256 antennas, is scheduled to start surveying the sky by this summer. When complete, the Long Wavelength Array will consist of 53 stations, with a total of 13,000 antennas strategically placed in an area nearly 400 kilometers (248 miles) in diameter. The antennas will provide sensitive, high-resolution images of a region of the sky hundreds of times larger than the full moon. 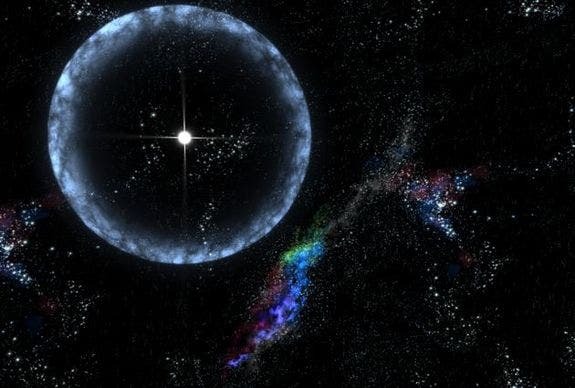 These images could reveal radio waves coming from planets outside our solar system, and thus would turn out to be a new way to detect these worlds. In addition to planets, the telescope will pick up a host of other cosmic phenomena. The new Long Wavelength Array will operate in the radio-frequency range of 20 to 80 megahertz, corresponding to wavelengths of 15 meters to 3.8 meters (49.2 feet to 12.5 feet). These frequencies represent one of the last and most poorly explored regions of the electromagnetic spectrum. In recent years, a few factors have triggered revived interest in radio astronomy at these frequencies. The cost and technology required to build these low-frequency antennas has improved significantly. Also, advances in computing have made the demands of image processing more attainable. The combination of cost-effective hardware and technology gives scientists the ability to return to these wavelengths and obtain a much better view of the universe. The predecessor Long Wavelength Demonstrator Array was also in New Mexico. It was successful in identifying radio flashes, but all of them came from non-astronomy targets — either the sun, or meteors reflecting TV signals high in Earth's atmosphere. Nonetheless, its findings indicate how future searches using the Long Wavelength Array technology might lead to new discoveries. "Because nature is more clever than we are, it's quite possible that we will discover something we haven't thought of," said Lazio. The Daily Galaxy via http://lwa.unm.edu .